WFP food assistance being offloaded from a truck at a distribution site in the South Kordofan capital Kadugli. The United Nations Food and Agriculture Organization (FAO) today called for urgent action and funding to prevent a looming crisis in Sudan’s Blue Nile and Southern Kordofan states, where the latest fighting combined with erratic rainfall has doomed next month’s harvest. The two regions, which lie on the border between Sudan and the newly-independent nation of South Sudan, have been the scene of deadly fighting in recent weeks that has displaced tens of thousands of people. UN officials have called on all parties to cease hostilities and to ensure access so that humanitarian workers can reach those who need help. FAO said in a news release that at least 235,000 people in both states need help given that food availability there is forecast to be “significantly reduced” following renewed fighting between Sudanese Government troops and the Sudan People’s Liberation Movement-North (SPLM-N). The fighting has disrupted the major crop season in Blue Nile and Southern Kordofan – two of Sudan’s main sorghum producing areas, according to the Rome-based agency. In South Kordofan, people fled at the start of the planting season and were unable to sow seeds, while in Blue Nile, fighting erupted later in the season so seeds were planted but people were forced to abandon their crops. “The latest fighting coupled with erratic rainfall means next month’s harvest is expected to generally fail,” it stated. The shortage of food stocks has already led to a doubling of prices, which are expected to continue to rise steeply. The agency also pointed out that seasonal livestock migration has been disrupted in both states causing large herds to be concentrated in small areas along the border. All international aid agencies have been barred from Blue Nile, so the true scale of the situation there is unknown, the agency said. Meanwhile, a small FAO team of national staff is currently on the ground in South Kordofan. Although their office was looted they were able to distribute seeds and tools to 20,000 vulnerable households in the calmer areas. “This timely support will help provide food for those most in need,” stated the agency, which is seeking some $3.5 million for its operations. 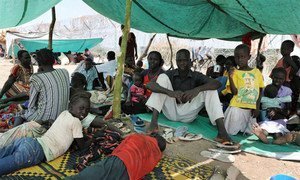 Fighting between the Sudanese armed forces and rebels in the country’s Blue Nile state has continued, displacing tens of thousands of people who cannot be reached by relief agencies due to movement restrictions imposed by the Government, the United Nations humanitarian office reported today.